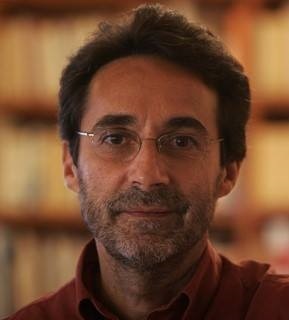 Ferran Requejo is a professor of political science at the Universitat Pompeu Fabra in Barcelona, where he is director of the Research Group on Political Theory (GRTP). His main fields of research are theories of democracy, federalism, multinational democraies and political liberalism after World War II. In 1997 he was awarded the Rudolf Wildenmann Prize, (ECPR), in 2002 he received the Ramon Trias Fargas Prize and in 2006 the Spanish Political Science Association Prize for the best book (Multinational Federalism and Value Pluralism, Routledge 2005)> Among his recent books are: Federalism, Plurinationality and Democratic Constitutionalism (Routledge 2012) and Federalism beyond Federations (with K.J. Nagel, Ashgate 2011). These analytical axes require a diverse battery of variables and indicators in order to carry out comparative approaches. 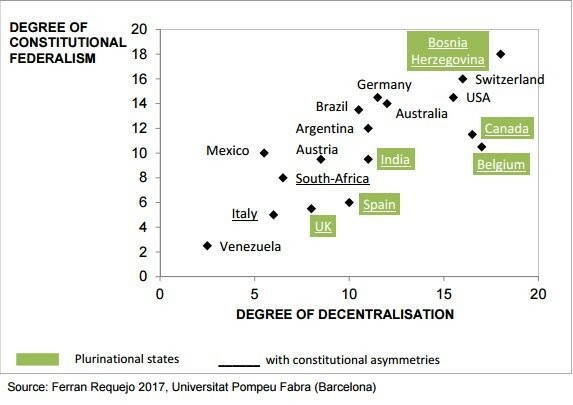 In order to answer the question of the title of this brief article I will focus only on the second and third axes (degrees of federalism and decentralisation), giving special attention to the position of the Spanish “Estado de las autonomías” from a comparative perspective. On the one hand, the unitarianism-federalism axis focuses on “how federal” a federation or a regional state actually is. It is established using a degree of federalism in each polity. We will include as indicators the existence, or not, of: federated polities as constituent units (1); constitutional guarantee of their self-government (1); agreement for constitutional reform (1); an institutional dualism in relation to the three classic powers: the executive and legislative (2) and the judicial (1); a model of fiscal federalism (2); an upper chamber with representatives appointed by the institutions of the federated entities (1), and with seats distributed along territorial lines (not proportional to the population) (1); powers of the upper chamber within the institutional system (2); the allocation of unallocated powers to the federated units (2); a court to arbitrate in disputes (2), with the sub-state entities having a say regarding who is appointed to it (2); and, finally, the regulation, or not, of a right of secession of (some) the federated units (2). The numbers in brackets refer to the score given to each indicator. Altogether, the global scale of each case is situated between 0 (absence of a federal logic) and 20 (maximum degree of constitutional federalism). We do not consider in this axis “para-institutional” indicators, those which have an effect on federalism as a process (e.g. party-political systems; inter-governmental relations). (See Requejo 2015, 2010). On the other hand, the centralisation-decentralisation axis refers to the degree of self-government of the units endowed with political autonomy. The degree of decentralisation (or lack of centralisation) is here also measured on a global scale which goes from a score of 0 (maximum centralisation) to a score of 20 (maximum decentralisation). It is also measured using different indicators: a) the kind of legislative powers enjoyed by these sub-units (8) -subdivided in specific areas of government as follows: economy/infrastructures/communication (2), education and culture (2), welfare (2), internal affairs/penal/civil codes and others (2); b) the executive/administrative powers (2); c) whether or not the federated entities have the right to conduct their own foreign policy, taking into account both the scope of the matters and agreements with federal support (2); and d) their economic decentralisation (8), calculated according to a single average index obtained taking into account the distribution of the public revenues and the public expenditures (GFS/IMF indexes) in each country. The cases of Ethiopia and Malaysia are not included in the degree of decentralisation due to the lack of reliable economic data (See also, Rodden 2004). The universe of the following analysis comprises democratic federations –excluding cases based on archipelagic federations such as Micronesia, the Comoros and St Kitts and Nevis, as well as federations which are a long way from the liberal-democratic logic (the United Arab Emirates, Russia, Nigeria, Pakistan, etc). Associated states/federacies and Supra-state entities such as the European Union have been also excluded. On the other hand, we include three European Western democratic states which display a clear territorial division of powers: the United Kingdom, Spain and Italy. Altogether, there are 19 federations or regional states in the following analysis. The next figure relates the degree of constitutional federalism and the degree of decentralisation which exists in the cases studied (plurinational cases are marked in green, while asymmetrical cases are underlined). Although the Spanish “Estado de las autonomías” shows an intermediate level in the axis of decentralisation it also shows a rather low level in the axis of constitutional federalism. However, it is a decentralised state when compared with other regional states and it has one important thing in common with federations: decentralisation is designed for all the territorial subunits and not only for some of them. The total of territories which enjoy constitutionally guaranteed political autonomy -currently 17 autonomous communities plus two cities in North Africa: Ceuta and Melilla – practically make up the whole of the territory of Spain. 1. Constituent units: The “autonomous communities” (AC) are not constituent entities. The current Spanish Constitution (1978) establishes “the indissoluble unity of the Spanish Nation” (art 2) and the “Spanish people” as subject of the “National sovereignty” (art 1). Some of the AC did not even exist as administrative regions before 1978. 2. Division of powers: The decentralisation of legislative powers is unclear. The central power maintains its hegemony through the so-called “leyes de bases” and “leyes orgánicas” (basic and constitutional laws), which are the same throughout the state and which can be developed in a centralising way in many areas (education, welfare policies, local power, civil servants, universities and research, etc). There are no clear procedural rules of “shared government” in the Spanish constitutional framework. 3. Judicial power: Unlike the legislative and executive powers, the “Estado de las autonomias” has had practically no effect on the structure of the judiciary, which continues to be that of a centralised state. 4. Senate: The upper chamber is not linked to the federated units. The majority of the senators are elected by the “provinces”, a set of administrative divisions which date back to the 19th century. The AC play no practical role in the legislative power of the “federation”. 5. Taxation: The “Estado de las autonomías” is a long way from any model of fiscal federalism. The most important taxes are collected by the central power, which later returns an amount equivalent to that which the AC “need” (permanent controversial quantification) in order to finance the powers that they have. The Basque Country and Navarre are the exceptions to this rule as they enjoy an asymmetrical fiscal agreement with the central power, which is based on a number of “historical rights” which predate the 1978 constitution and which are regulated under terms which are even more confederal than federal. On the other hand, this is the most asymmetrical legal characteristic of the Spanish political system. 6. European Union: The AC’s are not considered to be political actors in relation to the principal institutions of the European Union, in contrast to the federations of the EU (particularly, Belgium and Germany). The central government has resisted giving any important role for the AC in relation to European issues. 7. Constitutional reform: The AC’s do not participate in the process of constitutional reform. This is in the hands of the central parliament and of the citizens of the state through referenda. The general conclusion is that the current Spanish “estado de las autonomías” does not have important elements (institutional and procedural) that usually define “federations”. In fact, the Spanish Constitution included more potential asymmetrical elements than genuinely federal elements. However, most of these asymmetrical elements have not been developed in post-constitutional political and legislative practice. Despite the fact that the AC possess a medium degree of autonomy in some areas, the practical characteristics of the model have been predominantly developed on a regionalising perspective. In this way, a transitory asymmetry of powers was established to achieve the highest level of self-government. Notwithstanding, some works of comparative politics in which the Spanish state sometimes appears classified, in a not so very accurate methodological way, within the “federal” states, there are many arguments that would suggest that perhaps it would be more appropriately situated in the group of “regional” states. Elazar, D., 1991, Federal Systems of the World, Longman, Essex. Requejo, F. 2015, “National Pluralism, Recognition, Federalism and Secession (or Hegel was a clever guy)” in Alain-G. Gagnon, Soeren Keil and Sean Mueller (eds), Understanding Federalism and Federation, Ashgate, 2015: 157-176. Watts, R., 1999, Comparing Federal Systems, Montreal and Kingston, McGill-Queen’s University Press. Gagnon, A, S. Keil and S. Mueller. Understanding Federalism and Federation. Ashgate: Farnham. Requejo, F 2005, Multinational Federalism and Value Pluralism, Routledge, London-New York. Requejo, F. and M. Sanjaume. 2015. ‘Recongntion and Political Accommodation: From Regionalism to Secessionism – The Catalan Case in J.F. Gregoire and M. Jewkes (ed.) Recognition and Redistribution in Multinational Federations. Leuven: Leuven University Press, pp. 1070132.